The International Data Corporation (IDC) recently reported that 102.4 million wearable devices were shipped in 2016, representing 25 percent year-on-year growth. Despite this, innovation has slowed in the sector, with wearables being definitively “out” at Mobile World Congress this year. But the market won’t stay this way for long. Wearables as we know them are on the verge of becoming more truly “wearable” than ever before as they become invisibly stitched into our everyday wardrobe. As fashion designers and mainstream clothing brands begin seeing the value of making their garments smart, we’re entering the next evolution of fashion technology: connected clothing. Currently, the biggest wearable market drivers are health and fitness. For the second year in a row, Fitbit owns the largest market share thanks to its recent acquisition of Pebble and its existing line of more conventional wrist-worn fitness trackers. And with good reason. Health is the primary reason consumers purchase a wearable device, and 45 percent of wearable owners are sporting fitness bands. So it’s no surprise that apparel brands are using smart clothing to relay information about fitness and health back to their customers. At Paris Fashion Week last fall, British-Cypriot designer Hussein Chalayan partnered with tech giant Intel to bring something new to his Spring/Summer 2017 show. As models walked the runway, visual projections showed their stress levels on the wall beside them, via biofeedback being sent from the connected accessories they were wearing. The problem is that while wearables work well for fitness fanatics and make decent pieces of runway theater, they’re not becoming an essential item for everyday consumers. The smartwatch revolution didn’t create another universal “must-have” product like the smartphone, and a report from PwC recognizes that “over time, fewer consumers use their wearables daily,” evidence that this technology isn’t becoming habitual or part of our daily routines. Integration with the wider digital ecosystem of other products and services can help. Amex and Jawbone partnered to integrate NFC payment into wristband trackers, for instance. More compellingly, health insurance programs like Vitality from Discover offers a sophisticated rewards program and discounts on your healthcare premiums if you share your wearables data with them. But the real opportunity is not to create new wearable products, but to fold new smart, digital technology back into existing apparel products. Thirty-six percent of the respondents in PwC’s survey said that wearables should be “an important part of my wardrobe/outfits.” What better way to seamlessly fit wearable technology into your wardrobe than with smart apparel? By digitally-enabling clothing that they already sell—and that customers already love—brands can become an integral part of people’s everyday digital lives. And the technology and processes already exist to do this—at massive scale. Last year, EVRYTHNG partnered with Avery Dennison RBIS to enable more than 10 billion apparel and footwear products to be #BornDigital™. 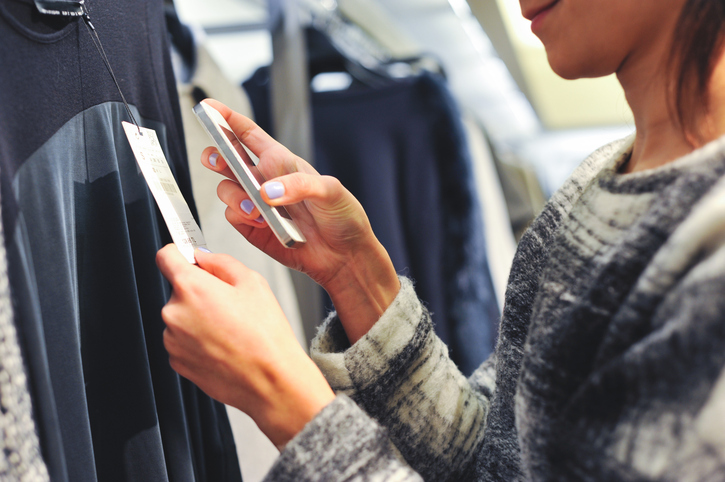 In a bid to “switch on” the apparel industry, we’re embedding unique digital identities into individual physical products right at the point of manufacture—connecting them to the Web via smart labels and tags that can be scanned by smartphones and RFID readers. This gives brands the ability to unlock new value with various digital applications, experiences and analytics. Download our ebook to learn more about #BornDigital™ apparel. Recently, fashion designers Rochambeau and Rebecca Minkoff have leveraged the power of #BornDigital™ to turn their products into an owned digital media channel and to create more valuable, direct consumer relationships. The Rochambeau BRIGHT BMBR contains a smart tag that allowed the jacket’s wearer to unlock exclusive experiences in dining, art, nightlife and fashion, including a digital pass to the designer’s Spring/Summer 2017 New York Fashion Week runway show. Ahead of her Spring/Summer 2017 Fashion Week show at The Grove in Los Angeles last month, Rebecca Minkoff unveiled the world’s first smart bag with a run of limited edition #AlwaysOn Midnighter bags. Each came with a hangtag that allowed buyers to unlock a VIP ticket to the runway show, in addition to other exclusive offers and experiences. We’re already well on our way to realizing the #BornDigital™ wardrobe of the future, which will empower brands to create unique experiences and personalized content for their customers, all while accessing valuable new insights and the ability to optimize their product operations. We don’t need to buy and wear another gadget. We just need the clothes we already wear to get smarter.